The book is big, bigger than the 2003 version of dynamic scheduling (also written by Eric), a nice 775 pages of project management best practices using Microsoft Project 2010. The book is written for the 2010 version of the product but most of the exercises and theory holds true for 2007 and 2013 as well. 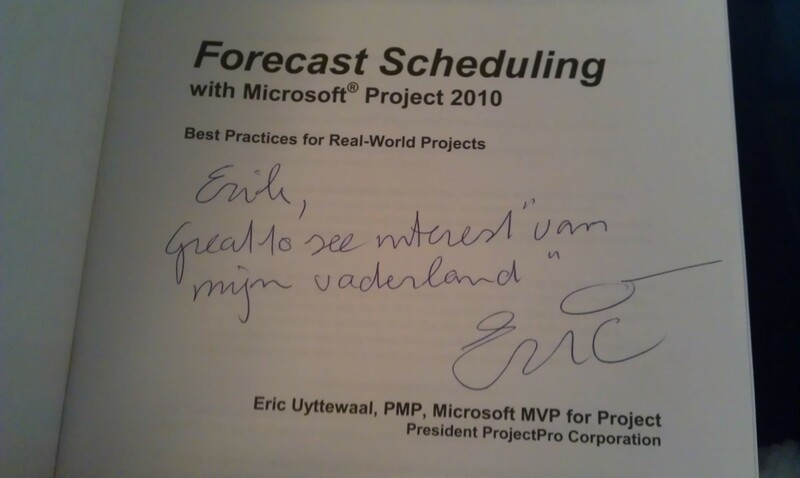 The subtitle of the book “Best practices for real-world Projects” sounds great! And the book holds true on this part. The book has extensive chapters on Work Breakdown Structure (WBS), assigning resources and task dependencies. The chapters that had my attention the most was chapter 11: Keeping the schedule Up-to-date. It had some great advice on Baselines and communicating progress on the schedules. The book also has a real nice Chapter summary with checklists for project scheduling and dynamic schedules. The summary chapter is one I grab back to every now and again to use during my lectures and courses on MS Project use. I am looking forward to reading Eric’s next book. The book is ideal literature for planners and project managers that don’t want to know everything there is to know about the application MS Project but instead need to know how to get the best schedule (one that works with you, instead of holding you back) as fast as possible. Gab a copy of the book through this link or the image of the cover. I give the book 5 out of 5 stars. I also reviewed the 2013 version of the book. If you are using Microsoft Project 2013, this is the book for you, read about it at my other book review post here.